Braune Gartenbrücke, Dekobrücke, Holzbrücke, Gartenteichbrücke, Bachlauf, Übergang, Steg, Deko-Brücke, Holzsteg, Überführung aus massivem Nadelholz, dunkel gebeizt, LxBxH 150x67x55 cm, Gewicht: 16 kg. Gartenbrücke - Teichbrücke. Aus Metall geschmiedet und sehr stabil. Mit hochwertigen Lackfarben lackiert. Farbe Patina Grün - Antik. Maße: Höhe 80 cm, Breite 82 cm, Länge 150 cm. Bodenhöhe 15 cm. Geländer Länge 150 cm. 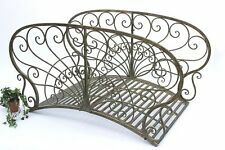 Laufsteg Breite 80 cm, Länge 140 cm. .
Gartenbrücke mit Geländer aus Metall, perfekt geeignet für den Garten. Antikes Design, dies wird ein neuer Blickfang in Ihrem Gartenbereich werden. Gut geeignet für Teich- und Bachübergänge Daten:Stabiles Gerüst. Farbe Schwarz-Braun. Maße: Länge 145 cm, Breite 87 cm, Höhe 80 cm. Geländerlänge 104 cm, Durchgangsbreite 83 cm, höchster Punkt der Krümmung 15 cm . Dekobrücke, Zierbrücke, Bachlauf, Steg, Gartenbrücke, Holzsteg, Terrassendeko,Überführung aus dunkel gebeiztem Nadelholz, Gewicht ca. 1 kg. LxBxH 70x32x25 cm. A British tradition. Close your eyes and make a special wish! Knowing there are few things more picturesque than a bridge crossing a brook in the English Cotswold countryside, we adopted one for our very own! Risse durch Trocknung und Arbeit des Materials sind normal und unterstreichen den natürlichen Charakter. Beachten Sie außerdem, dass der Witterungsschutz des Holzes regelmäßig erneuert werden muss. Mit 122 cm Länge überspannt sie problemlos Rabatten oder kleine Wasserläufe zwischen Zierteichen. Design Plans for building Garden Bridges and Fences. Rail - Rustic - Shadow Box - Louvered - Basket Weave - Combination Wood and chain link. Discover a Wealth of How-to Projects & Plans. We do not photocopy these. A bridge can add luster to an already beautiful garden view. (Decorative use only). The natural unfinished feature allows you to be creative --- the sanded-smooth finish can be painted or stained to match your style. Shine Company Inc. 4982N Cedar Garden Bridge, 6 Ft. Natural 6 Ft. 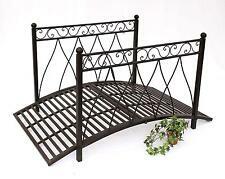 Size:6 Ft. A bridge can add luster to an already beautiful garden view. Cedar wood also have a beautiful grain and a knotty grade that add warmth and charm to it. Need your item quicker?. We would love to be given the opportunity to work with you to resolve any problem you may have. 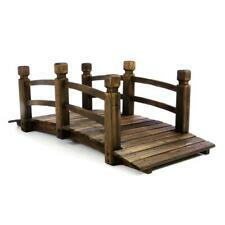 Size:4 Ft. A bridge can add luster to an already beautiful garden view. Cedar wood also have a beautiful grain and a knotty grade that add warmth and charm to it. We would love to be given the opportunity to work with you to resolve any problem you may have. Garden Bridge - Pont d'étang. Forgé à partir de métal et très stable. peint avec des couleurs de peinture de haute qualité. Couleur patine verte - Antik. Dimensions : hauteur 80 cm, largeur 82 cm, longueur 150 cm. plancher hauteur 15 cm. 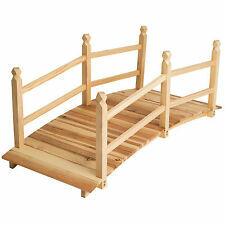 Balustrade longueur 150 cm. piste largeur 80 cm, longueur 140 cm. .
Pont de jardin avec garde-corps en métal, convient parfaitement pour le jardin. Antique conception, ce sera un nouveau point focal dans votre jardin. Bien adapté pour les transitions de l’étang et ruisseau Données : Cadre Stable. Couleur noir brun. Dimensions : longueur 145 cm, largeur 87 cm, hauteur 80 cm. Longueur 104 cm, largeur 83 cm, le point culminant de la courbure de la balustrade 15 cm . Ponticello del giardino con ringhiere in metallo, perfettamente adatto per il giardino. Antico disegno, questo sarà un nuovo punto focale nella vostra zona del giardino. Ben si adatta per le transizioni di stagno e flusso Dati: Quadro stabile. Colore nero marrone. Dimensioni: Lunghezza 145 cm, larghezza 87 cm, altezza 80 cm. Lunghezza di ringhiera 104 cm, larghezza 83 cm, il punto più alto di curvatura 15 cm . Ponte Giardino - Stagno Bridge. Forgiato da metallo e molto stabile. dipinto con i colori della vernice di alta qualità. Colore patina verde - Antik. Dimensioni: altezza 80 cm, larghezza 82 cm, lunghezza 150 cm. piano altezza 15 cm. Ringhiera di lunghezza 150 cm. pista larghezza 80 cm, lunghezza 140 cm. . This exquisite structure will transform your landscape. 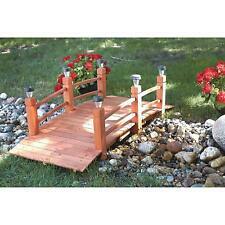 Decorative Wood Bridge With Solar Lights - 5ft. Equipped with functioning Lights on each Vertical Pillar. Made of Weather Resistant Wood. We do not accept P.O. Boxes.